The falcon-like thunderbird made his way to the location the Imperium's Guardians met at. No one was their, but the Tormaigh could wait. He was their for a reason. Ever since the monsters had shown up, the thunderbird had managed to avoid them due to his eyesight, which gave him an idea. He could see farther then many dragons, and fly faster then most that lived in the Imperium. These skills could make him a good scout, if the dragons would except him. The Nightwings in particular. right? I mean, they probably need anyone who is willing and able, and I am both. Putting my prey where my mouth is with what I said at that meeting with the rulers. The current unwinding of events had been unexpected at best, and devastating at worst. The sudden upturn of horrible, disfigured monsters, ravaging through the fragile arms of the Imperium, had made everyone instantly grow tense, worried, and paranoid. The EarthWings especially were beginning to suffer, thanks to their small numbers and lacking territory. The NightWings, meanwhile, were beginning to regret their lax attitude towards fighting, and their priorities towards more attitudes of nobility. Now everyone was rushing about the kingdom like chickens with their heads cut off. And of course, because of this, Shiera had more work than ever. She had been rushing back and forth between Tenebris' home and other locations around the NightWing territory, doing a variety of work. Most of this included some minor labor, and a bit of paperwork, as well as sort of being courier for all the important letters Tenebris wrote out that weren't so vital he himself had to send them. That being said, Tenebris was busy enough himself trying to wrangle all of his citizens together, and to attempt to reduce the panic. One of the things Tenebris was doing, of course, was increasing the guard. Shiera was on her way to let the captain know Tenebris' orders, her wings carrying her across the vast, swampy marshes of the Nightwings. She finally spotted one of the guard bracken headquarters, and began to decrease her speed, aiming to fly down and walk the rest of the way. The wind would begin to get a gruff, pulling feel as she made her decline, almost as if begging her not to go. She would land on the ground with a thud, digging her paws into the earth. It sure was refreshing to be back on land again, she thought with a small sigh. As she would begin to make her way inside, the sound of flapping caught her attention. Lifting her head up, she spotted something rather peculiar. A thunderbird. And not any thunderbird. From the looks of it, it seemed it was the same thunderbird from the gathering! Tormaigh looked down to see a Manticore walking up to the Guardian's headquarters. He tilted his head the moment he realized just who this big cat was. It was the one from the Imperium gathering. The one that said she was happy being a slave. The large bird soon landed near the feline, looking at her human-like face with a slight smile and a happy, yet series, tone of voice. "Hello, Manticore. I remember you from the gathering, though I do not believe we truly met. My name is Tormaigh." The Thunderbird continued to eye the Manticore, trying to figure out what she was doing. She was Tenebris' slave, he hated even thinking that, so it had to be important. Tormaigh began to wonder what message she might be carrying, but quickly decided not to ask. "So, are you here to meet the Guardians as well?" The thunderbird began to make his descent. Shiera noticed he was flying towards her, so she paused a moment to see what it was he wanted. Even though the thunderbird seemed to show a look of happiness towards her, or at least semi happiness, Shiera remained stoic. She wasn't much interested in chit chat. She also found it rather stupid of the thunderbird to come back to NightWing lands after everything that had occurred back at the meeting. But still, she remained silent. She'd voice her doubts once the thunderbird landed. He introduced himself as Tormaigh. She found that name had an interesting catchiness to it, and wondered what its origin was. She had learned that certain names had come from certain regions, and what not, and they all could sound different because of different cultures and the whatnot. It had made Shiera mildly interested in visiting the other tribes, learning just how different they were from the NightWings. Shiera wasn't required to bow to the thunderbird, like she was with most other dragons. She bowed as a sign of respect and inferiority. Usually it wasn't a full bow, just a dip of the head. But this, again, was a thunderbird. She'd look him over, examining him more closely. He was much larger than Shiera was, which was ironic, considering how large manticores could get. In fact, he was a little over twice her size. He also didn't really look like what Shiera had expected a thunderbird to look like. In fact, he looked more like an oversized falcon than a thunderbird. She didn't doubt that from a distance, you might mistake him for one. "Hello, Tormaigh. If we are introducing ourselves, then my name is Shiera. And yes, I am heading towards the guardian barracks, as I'm delivering a message for Archon Tenebris..." she trailed off for a moment, regarding Tormaigh once more with her catlike eyes. If Tormaigh's gaze were to drift down to her neck, he'd notice she was wearing both a collar and a medallion. The collar appeared to be made out of silk or felt, unlike most slave collars which were hard and metallic. The medallion, meanwhile, seemed to be made out of silver, or perhaps designed to look like silver, and it had the emblem of Tenebris' embedded in it. Finally, Shiera spoke again, "I can't seem to understand why you'd want to come back here. You should know full well the NightWings don't recognize you as a citizen." Tormaigh listen to the manticore, Shiera. That was a nice sounding name. And he noted how small she was compared to himself. 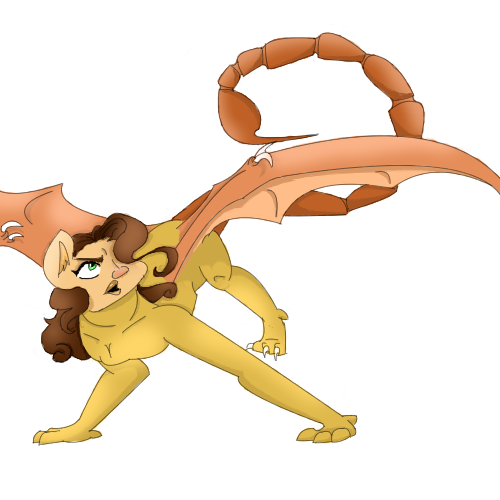 Most manticore were a lot larger then him, but Shiera was quit short. She then said that she had a message from Tenebris for the Guardians there. Made sense. As much as he hated Tenebris, the "Archon" needed to keep in touch with Guardians and keep his people calm with what was going on. He probably he a few other delivering messages like Shiera was. Then she paused and looked at him. Tormaigh finally got a good look at the collar and medallion that she wore. Despite them looking quite nice, the thunderbird didn't like them, knowing what they meant. He could never really understand why she seemed fine with being a slave, or at least from what little he had seen of her. He couldn't even see how she could be raised to think that. and that is why I am here. To become a scout specifically. And this was the closest post I know of that I wasn't blocked by those... things." Shiera listened to what Tormaigh said with a neutral expression on her face. He was awfully righteous, wasn't he. And perhaps a bit too optimistic. However, it wasn't Shiera's place to question what the thunderbird did or didn't do. No, that would be the NightWings' job, were they to get a hold of him. She definitely knew if Tenebris saw him again he would no doubt force him into slavery. But what could she say about those who followed under Tenebris? "I see. Well, I'm warning you. You go in to see the guardians, I cannot guarantee that you'll come out a free bird," she warned him, staring at him with a fierce look in her eye. Despite the fact Shiera didn't object to being Tenebris' slave didn't mean she shared the same mentality as the NightWings. In fact, Shiera was quite the opposite. She found that many of her own kin, such as her brother Calzen, had been much more intelligent than some of the dragons here. Dragons liked to make their gross superiority complexes make it seem as if they were intelligent, when in fact they were just noble snobs. And Shiera certainly wouldn't wish slavery onto another lesser species. Even if he wasn't a manticore, Shiera still didn't want to see him in shackles. if I do nothing after those things chased both me and dragons out of our shared territory.... It make me no better then anyone else who would abandon the Imperium now." The thunderbird then lifted his head and looked around. It was odd that him and Shiera, two non-dragons who weren't even Guardians themselves, seemed to be the only ones there. He hoped other regions of the Imperium weren't like this. If the citizens needed Guardians right now, there would not be anyone to help, unless they trusted a thunderbird and manticore to help. Slowly, Shiera shook her head once more, a soft sigh escaping her. Even if she thought this thunderbird was clearly insane, she admired his determination and loyalty to those he loved. She, of course, had no doubt he would probably just end up getting himself killed, but in a weird sort of way, maybe that wasn't such a bad thing. Maybe some were just willing to die for their love. But nonetheless, Shiera didn't have time for this. She gave the thunderbird one last contemplative look, blinking at him, "I certainly hope you find what you're looking for, and are able to convince the NightWings you're actually able to help them. But I still think your plan is insane." she commented. Curiously enough, she smiled a bit over at the thunderbird after her last statement. She then turned, and headed up towards the large gates of the imperial fort, her tail swinging absentmindedly behind her. The papers she needed to deliver were safely nestled around her neck, as she would go up to the fort. Tormaigh listens to what Shiera had to say. He couldn't help but chuckle at her final comment, and noticed the smile on her face. The only response he really had was to smile back. He then watched as she began to off, probably to do what she had come to do. The Thunderbird then called out to the Manticore. "Good luck, Shiera."